Donald William Buck was a son of Herbert and Ellen Mary Buck (nee Webb), of Railway Station, Clare, Suffolk. He was born on 23rd November 1897. Donald Buck was educated at Cookley and Walpole Church of England Voluntary School on 1st October 1901 and after that at Beccles College. When he finished college he worked at Messrs Cook and Sons (Thomas Cook) in London. On 9 september 1914 Donald William Buck enlisted into the Army. He served with the Expeditionary Force in France and Belgium from 25 may 1917, being attached to the 8th Battalion East Surrey Regiment as first class signaller. He was killed in action near Passchendaele while laying a wire under heavy fire. He was buried near Gloucester Farm, between Passchendaele Ridge and the Poelcappelle Road. His commanding officer wrote: "He was a fine lad, and had he lived, would have been recommended for a decoration for bravery." 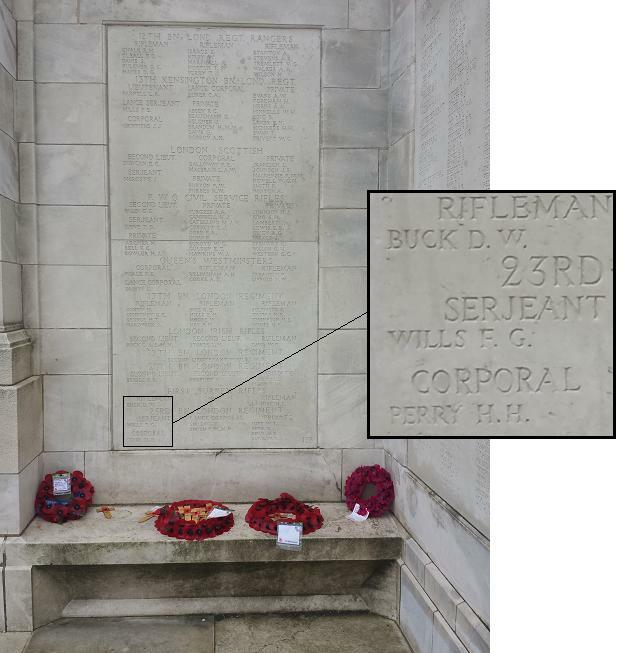 Buck has no known grave and is commemorated on panel 152 of the Tyne Cot Memorial.